We Declare. 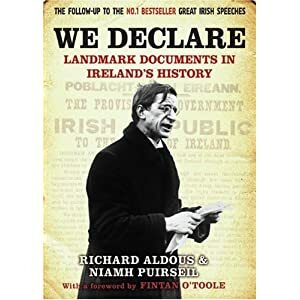 Landmark documents in Ireland’s History (Co-authored with Richard Aldous) (Quercus 2008). Farewell to the Terrace (UCD, 2007) (Co-edited with Ruth Ferguson). ‘Labour in name only‘ (not my title!) Jacobin 21 Spring 2016. ‘”The Schoolmasters’ Rebellion”: teachers, the INTO and 1916′ in Saothar 41 (2016). ‘William Norton’ in Emmet O’Connor and John Cunningham (eds) Studies in Irish Radical Leadership: Lives on the left (Manchester University Press, January 2016). ‘T.J. 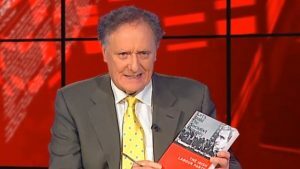 O’Connell: Pioneer of the Irish National Teachers Organisation and Labour Party Leader’ with John Cunningham in Mayo History and Society (2014), Nollaig Ó Muraíle and Gerard Moran (eds). ‘A new Democratic Programme’ in Theo Dorgan (ed.) Foundation Stone. Notes towards a constitution for a 21st century republic. (New Island Books, 2014). ‘The echo of the Battle. Labour politics and the 1913 Lockout’ in Francis Devine (ed.) 1913. A capital in conflict: Dublin city and the 1913 lockout (Dublin City Council, 2013). ‘Labour and the Left in Irish politics’ in P. Rouse, P. Daly and R. O’Brien (eds) Making the Difference? 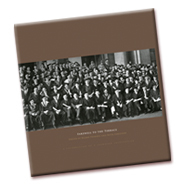 The Irish Labour Party, 1912-2012 (Collins Press, 2012). ‘Economic and labour history’ in L. Lane, M. McAulife and K. O’Donnell (eds) Palgrave Advances in Irish History (Palgrave Macmillan, 2009). ‘Catholic Stakhanovites’? Religion and the Irish Labour Party in Devine, Lane and Puirséil (eds) Essays in Irish Labour History. 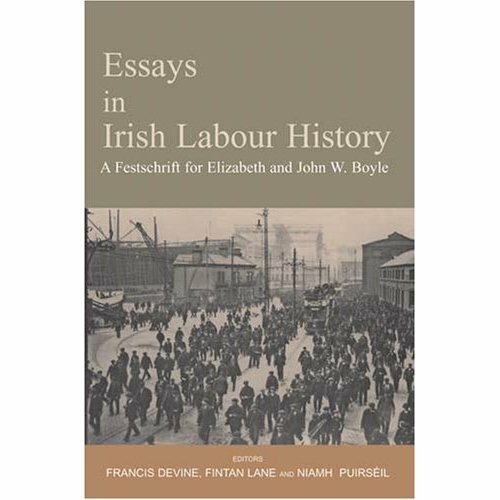 A Festschrift for Elizabeth and John W. Boyle (Irish Academic Press, 2008). ‘“Is that some kind of allowance?”: Irish Entry to the EEC and popular opinion’ (with Gary Murphy) in Irish Political Studies Vol. 23 No. 4, December 2008. ‘Labour and the Great war’ John Horne (ed.) Our War. Ireland and the Great War (RIA, 2008). ‘Political and party competition in post war Ireland’ in B. Girvin and G. Murphy (eds), The Lemass Era: Politics and Society in the Ireland of Seán Lemass. (UCD Press, 2005). ‘Labour and coalition: the impact of the first inter-party government’ in Saothar 27, 2002. ‘New light on the arms crisis’ History Ireland (July 2009). ‘Black and white and red all over. Labour Party papers and Propaganda’ History Ireland (May 2009). ‘The Seán O’Casey letters in the National Library of Ireland’ (sources article) Saothar 31 (2007). I’m a former editor of the Irish Labour History journal, Saothar, and have worked on a number of research projects including work on higher education and ethics in journalism for publication and otherwise.